As you make your way forward this week, my darlings, always remember that you can handle any situation so much better once you can control yourself. Let’s get to it. LEFT: THE TOWER. Considered one of the dark cards of the Tarot, The Tower represents crisis, major upheaval, and the need for change. When this card appears, your best bet is to roll with the punches and be flexible with what Life throws at you next. Expect the unexpected, and understand that the Universe never gives you more than what you can endure. The Tower often appears as an indication of a sudden onset of sickness, the abrupt ending of a job/relationship, and/or any change that requires you to leave behind outdated mindsets and move on. So long as you’re prepared for anything (and really, nothing is impossible with this card), you’ll be fine. 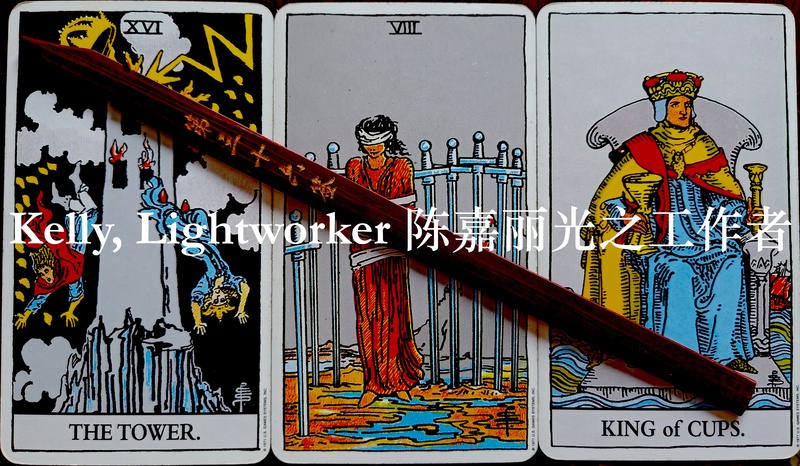 MIDDLE: EIGHT OF SWORDS. This card represents the energies of entrapment. All solutions have been considered and dismissed, and/or some information has been withheld – consequently, you’re stuck. Or at least, you think you’re stuck. This is not a great card to get; next to The Tower, it’s particularly painful. The challenge this week is to resist fear, doubt, or self-pity. The promise is that you can. This week’s events can turn around for the better once you choose to surrender your challenge in the hands of the Highest Power. By surrendering, I don’t mean that you give up, take on a passive approach, or start seeing yourself as a victim. It means the opposite: you empower yourself by asking the Divine to stand with you in battle, in a holy alliance, as you both get through this struggle together. RIGHT: KING OF CUPS. In the Tarot, the Kings represent mastery of the domain signified by the Suit. The King of Cups, therefore, speaks of emotional mastery and self-control. get a grip on your feelings. Whatever happens – keep calm and carry on. It is also possible that a calm, emotionally centred person could play a role in events this week. Keep an eye for a King of Cups who could help out – btw, in the Tarot, Kings are usually men but they can be women, too. Despite the difficulties before you, remain calm. An abundance of blessing is yours for the asking. You will be liberated and will return home, carefree. I love how the Goddess divination lot complements the Tarot so beautifully. While the Tarot warns of major change, entrapment, and the need for calm, the Goddess divination lot promises us that when we choose to maintain our inner equilibrium – and when we seek the abundance of blessing that only Divine help can provide – we gain the peace of mind and freedom in our spirits that is our true birthright.